RICHMOND, CA/SINGAPORE (January 27, 2011) - House Rabbit Society (HRS) and House Rabbit Society Singapore (HRSS) strongly urge people not to acquire live rabbits for the Year of the Rabbit unless they are willing to make a 10-year commitment to properly care for the animals. 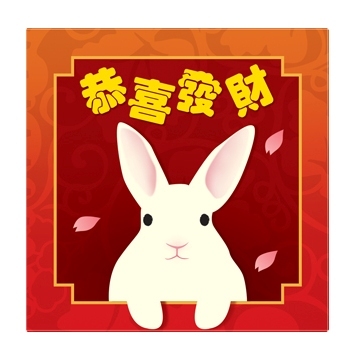 In the Chinese calendar, the Year of the Rabbit occurs every twelve years. Asian animal welfare groups like HRSS are warning of an inevitable outcome this year: abandoned and neglected bunnies. In Asian countries, and in Asian-American communities in the United States, there is a growing demand for pet rabbits, who are thought to bring luck during the Year of the Rabbit. Once the year is over, the rabbits are often abandoned. HRSS reports that in the 1999 Year of the Rabbit, rabbits in Singapore were abandoned at that nation's shelters at twice the rate that they were in 1998. Both HRS and HRSS point out that while rabbits are intelligent, curious, loving pets, they are not "lucky charms." In addition, they are not low maintenance pets. Margo DeMello, president of HRS, encourages rabbit lovers to celebrate the Year of the Rabbit by purchasing artwork and gifts adorned with rabbits. Items can even be purchased from rabbit rescue groups, which then benefit rabbits, such as the rabbit-themed angbao (red envelopes in which to give money) sold by HRSS. "Rabbits are not 'low maintenance' pets," says DeMello; they require at least the same amount of work as a cat or dog, and often more." Mary Cotter, vice-president of HRS, says that many of the rabbits purchased for luck will never live to see their first birthday. Some will die from neglect, while others will be abandoned in local parks or left at animal shelters. "It is irresponsible for pet stores to push rabbits during the Year of the Rabbit" says Cotter. "Unless people are willing to take full responsibility for the possible 10-year lifespan of a live rabbit, they should not acquire live rabbits. They should decorate their homes with rabbit-themed items instead." Children, especially, do not realize that rabbits are fragile, ground-loving creatures who will struggle when held and are easily hurt when dropped. Also, it is near impossible for a child to commit to a rabbit for 10 years. All too often, the child loses interest, and the rabbit ends up unwanted. "Many pets in Singapore suffer unnecessarily because of ignorance on the part of their owners," commented HRSS President Jacelyn Heng. "During the Year of the Rabbit, many people buy rabbits for the wrong reason and do not fully understand the responsibilities of keeping an animal at home. The problem is particularly acute for rabbits because people wrongly assume that they are low-maintenance starter pets for children." Jacelyn added, "Many pet shops in Singapore are also not well informed about the care needed for a pet rabbit and often provide wrong or false information to unknowing first-time owners." For people willing to make a long term commitment to a pet rabbit, HRS and the HRSS recommend adopting a rabbit from local animal shelters or rabbit rescue groups instead of purchasing them, as there are simply too many rabbits desperately in need of a good home. For those who are unsure about the commitment that they are able to offer, toys or rabbit-themed gifts would do just as well for this Lunar New Year's celebrations. Let's make this Year of the Rabbit a truly enjoyable time for our rabbits. Housing: Bunnies need a roomy indoor space to call their own. There should be room for a litterbox, toys, food and water bowls. Playpens or puppy exercise pens are a good alternative to the small cages sold in pet stores. Outdoors: Rabbits should never be left outdoors unsupervised. They can, literally, be frightened to death when approached by predators such as dogs, cats, raccoons and owls. They can also dig under fences to escape. Litter Box: Rabbits, once spayed or neutered, will readily use litterboxes that are place in one corner of the rabbit's cage; the rabbit's running space should contain at least one additional box. Use dust-free litter--not the clumping kind, and no softwood shavings. Health: Like dogs and cats, rabbits should be spayed or neutered. The risk of uterine cancer in unspayed female rabbits is alarmingly high, and unneutered males are likely to spray. Grooming: Rabbits shed their coat 3-4 times per year; use a flea comb and brush away excess fur. Expect an unneutered/unspayed baby may spray urine on the walls. Know that neutering/spaying (at four to six months) will greatly alleviate or stop the problem. Allow the rabbit at least 30 hours a week of free time outside her cage. Know the cute baby will soon be an adult rabbit and may have a different personality. House Rabbit Society is an international, volunteer-based nonprofit organization with two primary goals: 1) to rescue abandoned rabbits and find permanent homes for them; 2) to educate the public and assist humane societies in teaching proper rabbit care. HRS has fosterers, educators, and chapters around the world, and a rabbit adoption and education center in Richmond, California. The House Rabbit Society Singapore is an all-volunteer, non-profit organization dedicated to rabbit welfare and awareness. The HRSS runs a fostering program to rescue and re-home abandoned rabbits and participates in numerous public events to educate the general public about rabbit care and behavior. House Rabbit Society isa nonprofit rescue and education group. We welcome your feedback and appreciate your donations.Please join today!